+Traumatic Blood Contact During Pregnancy and/or Birth. Recognizing this conditionallows us an early diagnosis, a predictive hypothesis and a right view of mother/daughter relationship, that is not conflicting but is simply perturbed by an immunological alarm. It is also a reframing: from conflict to alarm, that is a form of love, even if dysfunctional. The psychological and nutritional causes and treatment. 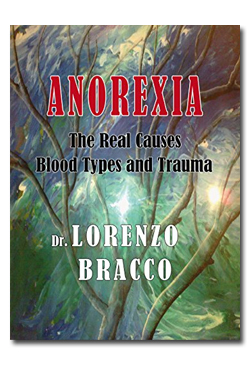 Keywords: Anorexia, Blood Type, Adolescent, Lorenzo Bracco, Trauma, Placental Trauma, Blood Mismatch, Predictive Diagnosis, Early Diagnosis. Anorexia is an eating disorder in which the most serious cases can continue over a prolonged period of time and might involve the total rejection of all kinds of food. Anorexia of the Female Adolescent(anorexia that arises in the female during adolescence and can re-appear throughout the course of life). Between these two kinds of anorexia, the prevalent and the most dangerous is the Anorexia of the Female Adolescent. To take care of this type of Anorexia we must treatthe causes or situations of which it is a symptom or a consequence. There must also be a food re-education program because, after a long time of fasting and poor feeding times, the person has lost orientation in eating. The food re-education program must actively involve the person so that he/she not only acquires knowledge, but also adjusts his/her eating habits to a proper diet. To this purpose, it is necessary to involve the nutrition scientist in therapy. Treatment of this type of anorexia requires the intervention of medical doctor and, very often, in parallel the intervention of psychotherapist. This is particularly true in the case with anorexia resulting from burnout and depression that frequently manifests itself after a period of extreme stress also during childhood, adolescence, adulthood in response to a failed attempt to seek acceptance within the family or the society. Depression can also manifest itself as a result of an experience of exclusion a person has suffered, like a separation from one’s family, divorce, work termination, retirement, etc… This depression can assume particularly serious aspects and can be cause of Eating Disorders. Most times these Eating Disorders take the form of an excessive consumption of food because a person seeks comfort and compensation for lack of affection. Other times, however, these Eating Disorders can involve an insufficient food intake, which can potentially develop into Anorexia, expecially when an individual is so embittered that he or she no longer has the will to live. Usually this Anorexia responds relatively well to pharmacological therapy, while Anorexia of the Female Adolescentdoesn’t react to pharmacological therapy. Anorexia of the Female Adolescent(the prevalent and the most dangerous kind of anorexia) manifests precisely during the phase of a young woman’s blossoming femininity. There can also be relapses of this form of anorexia over the course of life. This kind of anorexia strikes societies and social classes where the variety and quantity of food can be abundant. refusal to recognize the gravity of the situation. affective and emotional communication between family members. The causes of anorexia are explained in different ways by various therapeutic models, additionally, I have identified a specific condition in female adolescents who struggle with anorexia. I am a medical doctor and a psychotherapist, and I have been interested in eating disorders since I started my career. I began to focus my attention especially on Anorexia of the Female Adolescentin response to an event that might seem curious, but that had the same effect on me as the apple did on Newton. Twenty four years ago, I was visiting one of my patients, a 30-year-old woman at that time. She suffered from anorexia, which she had been experiencing off and on since her adolescence. Her fetal life and her birth had been constantly problematic: placenta abruption happened several times, bleeding occurred, and her birth witnessed a great loss of blood. As a medical doctor normally does, I was filling out the clinical record and asked the young lady numerous questions. The patient’s mother was present during the medical visit. When I asked the daughter a simple question, “Do you know your blood type? 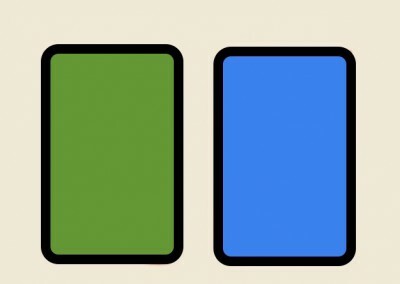 Is it 0, A, B or AB?”, something unexpected happened. The mother became extremely alarmed and went on repeating obsessively: “My daughter doesn’t have my blood type!”. I was astonished by the vehemence and the emotional charge of the mother. 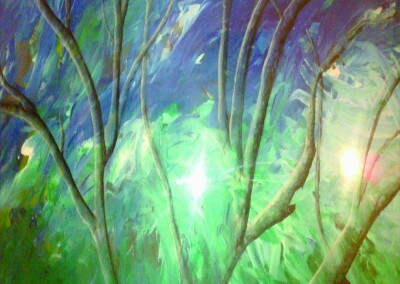 “Curious”, I thought, instead of becoming irritated as a result of the mother’s intense interruption. Anorexic young women do not possess the same blood type (0, A, B, AB) as their mothers. The placenta manages the exchange of oxygen, carbon dioxide, nutrients and waste between the blood of the fetus and the blood of the mother. The placenta does not permit red blood cells of the mother and those of the fetus to come into contact. For this reason, there is usually no problem between mother and daughter with different blood types (0, A, B, AB). But what happens if the different blood types of the mother and of her daughter come into contact? This could happen, for example, during a high-risk pregnancy and/or birth (if it is particularly traumatic) or during any other event that may have led to contact between the blood of both mother and daughter. These events, which cause the passage of a few red blood cells beyond the placental barrier (if the red blood cells were so many, the reaction would cause spontaneous abortion),can be caused by placental suffering due to natural causes or sometimes also following invasive surgical or diagnostic intrauterine interventions. Let’s go back to our question: what happens if the different blood types of the mother and of her daughter come into contact? Something very similar to the alarm when a transfusion, between a donor and a patient of incompatible blood types, occurs in medicine by mistake. In the case of wrong blood transfusion, the patient is at risk of dying. But here we are not talking about a transfusion, they are just only a few drops that cross the placenta. If only a few drops of incompatible blood come into contact with each other, the fetus is not at risk of dying, however an alarm is triggered, an alarm that is one of the strongest in the human body. This alarm perturbs the relationship between mother and daughter especially in such a sensitive period as the daughter’s adolescence. only the women who have a different blood type (0, A, B, AB) from the mother are anorexic. For example, a family had two daughters who were my patients, and only the one with a blood type different from that of the mother was anorexic. many women have a different blood type from the mother and are not anorexic. the ground(biological condition), the necessary but not sufficient condition (conditio sine qua non),for Anorexia of the Female Adolescent. Let me explain it better. The ground is the upstream condition that allows the causes to be efficient and lead to Anorexia. Anorexia cannot be induced solely by the causes we have listed (disfunctional: relationship with herself, mutual mother/daughter relationship, mutual father/daughter relationship, mutual relationship between the girl and the environment surrounding her, affective and emotional communication between the family members, eating habits of the family). On the other hand, the ground alone without causes cannot induce Anorexia. Nowadays Anorexia of the Female Adolescentis very dangerous, revealing a high mortality rate. This mortality is usually due to the fact that the diagnosis is made too late, indeed many anorexic girls seek help from medical services for the first time when they are already skin and bones (long after three months of absence of the menstrual cycle: six months, one year, sometimes longer). Knowing that a girl has a different blood type from her mother, she may be subject to discreet monitoring by the family doctor or school psychologist. As soon as he sees that the girl is slimming, he must check if the girl has had the menstrual cycle in the last three months. If the control give a negative result, the girl could have early diagnosisof Anorexia of the Female Adolescent, certainly not long after the third month of absence of the menstrual cycle. In addition, if we know that blood types are different and, moreover, we are able to determine whether there has been mother/daughter blood contact, we can formulate not only an early diagnosis of Anorexia of the Female Adolescent, but we can also formulate a hypothesis of risk (predictive diagnosis) well before adolescence (Bracco, 2014). We could set a therapy without waiting for the girl to become skinny. Being underweight constitutes a hazard for life and in any case having been for a long time underweight can lead to lifelong deficiency syndromes (such as osteopenia and osteoporosis) even if Anorexia has been resolved. This immunological, neurovegetative, physiological and emotional alarm – different blood types (0, A, B, AB) in mother and daughter coming into contact with each other during the pregnancy and/or at birth – is a real trauma that disturbs the mother/daughter relationship, especially during adolescence of the daughter. This alarmed relationship between mother and daughter is wrongly interpreted, by the environment and by them, as a conflict. My theory allows you to interpret the relationship between mother and daughter not as conflicting. The relationship is loaded with an alarm triggered by the immunological, neurovegetative, physiological, and emotional alarm due to trauma of incompatible blood types contact. My new perspective brings a wave of peace within the family: one thing is to think that the relationship between mother and daughter is conflicting, and much else is to see that relationship as an alarmed relationship. The alarm is, however, a form of love, albeit dysfunctional. Interpreting the mother/daughter relationship as an alarmed and non-conflicting relationship leaves the family out of that shadow of shame and blame in which it would tend to be in the case of anorexia. Blame is often rampant in families with an anorexic daughter, but the blaming, typically and paradoxically, simply leads to an intensification of the symptomatic behaviors. The word “anorexia” would no longer be a source of shame, but it would become a speakable word by the family at the first suspect and this would also facilitate access to therapy. In this perspective the differences between mother and daughter can be interpreted as a source of enrichment for both, rather than a source of shame and blame.The family no longer needs to play the blame game:Who is to blame?The mother?The daughter?The father?The shadow of blame and shame can leave the family. The vision of the scene changes completely: from the alarm to the peace. An anorexic daughter is no longer seen as hostile, but as a person seeking her identity. Respecting these differences between mother and daughter may actually encourage the young girl in her own differentiation and self-discovery. The alarm caused by contact between incompatible mother/daughter blood types is a real trauma, as we said, and the strong effects of this alarm are immunological, neurovegetative, physiological and emotional. Let’s see these a little better. The immunological effects. In this regard, a brief medical explanation is required. 4) by the presence of both antigens A and B (AB blood type). An organism that comes into contact with an incompatible blood type triggers the immune response of antibodies against the blood type antigen. 1) Mother of blood type A and fetus B or mother B and fetus A. It is the worst case for absolute blood incompatibility for both: blood type A is incompatible with B, blood type B is incompatible with A. In the case of blood contact, both are experiencing an immunological alarm. It is no surprise that the relationship between the two is burdened with mutual alarm and masked refusal. Moreover, the immune system of the fetus is not only alarmed by the introduction of a exogenous antigen, but being the immune system still in a maturing process is disturbed and confused by this exogenous antigen. This daughter, even after birth, is likely to have a perturbed immune system, so she easily suffers from allergies also associated with food. If these allergies associated with food are not recognized, there are two possibilities: v) she lives with a toxic nutritional intake because she also eats foods she is allergic to; v) instead of having balanced and varied nutrition, she reduces food choice more and more, in extreme cases she can afford to eat only one type of food (eg zucchini) and this behavior is actually caused by the fact that she doesn’t identify the source of her allergy. Consequently, it is important to test for food allergies with her. A close collaboration between healthcare professionals, in this case between psychotherapist and nutritionist, is, therefore, crucial, not only during the acute stage of treatment, but also throughout the life of this person, because allergies tend to change over time. 2) Mother of blood type A or B and fetus 0or mother of blood type AB and fetus A or B. In the case of contact between the two blood types, the person who is in danger is the fetus. The fetus 0 for the mother is not a problem, since the blood type 0 is a universal donor. Who lives the immunological alarm is the fetus because both A and B blood types are incompatible with the fetus’s type 0. It is no surprise that the daughter has a relationship of alarm and masked refusal to his mother. Moreover, as we have said above, immune system of the fetus is not only alarmed by the introduction of a exogenous antigen, but being the immune system still in a maturing process is disturbed and confused by exogenous antigen. As in the case that we have described above, this daughter, even after birth, is likely to have a perturbed immune system, so she easily suffers from allergies also associated with food. Regarding allergies and their management, refer to point 1 above. 3) Mother of blood type 0 and fetus A or B or mother of blood type A or B and fetus AB. Blood type 0 is compatible with blood type A or B (so much so that blood type 0, the so-called “universal donor”, can donate to other types but do not receive from them)and blood type A or B is compatible with blood type AB. Therefore, in the case of contact between the two blood types, who lives an immunological alarm caused to the organism by the incompatible blood contact is the mother and not the fetus who has no particular immune effects from the event. The mother feels alarmed and in danger with her daughter. This mother’s alarm triggers a particularly strong and violent reaction of the girl when she becomes an adolescent beginning to have menstrual cycles. The neurovegetative effects. To understand these effects a brief introduction to the Neurovegetative System is opportune. The Neurovegetative System is composed of 1) the Parasympathetic System, which is mostly in the vagus dorsal nerve(but also in the pelvic nerve) and 2) the Sympathetic System. A healthy life requires a constant balance between these two systems. When an event leads to the activation of one of the two systems beyond the person’s management capacity (called “resilience”), the person perceives it as traumatic. When this activation involves the Parasympathetic System, there is a “freeze and collapse” response, otherwise known as the dorsal vagal response (freeze and collapse response can involve also the pelvic nerve, but it would be the subject of a study of sexuality). When this activation involves the Sympathetic System beyond the person’s management capacity, there is an over-excited sympathetic response. Early developmental traumas – those occurring from conception to birth – usually involve the Parasympathetic System, with the dorsal vagal “freeze and collapse” response. The vagus nerveis the point of contact between the Parasympathetic Neurovegetative System and the Extrapyramidal System of the Central Nervous System.It is the tenth cranial nerve (CNX) and consists of the dorsal vagal nerve, made of parasympathetic fibers (belonging to the Neurovegetative System) and theventral vagal nerve, made of extrapyramidal fibers (belonging to the Central Nervous System). An event so traumatic (as contact between incompatible mother/daughter blood types) that it is life-threatening, right at the start of one’s life, causes a very strong reaction of the Parasympathetic System (dorsal vagal). This is the physiological system that allows the organism to store energy. A human being, whether fetus or newborn, when faced with a dangerous situation during the gestation period or birth can only attempt to conserve energy while waiting for the situation to resolve itself. Fetus is incapable of either fighting or escaping. This means the fetus is not able to activate the other neurovegetative system, the Sympathetic System, whose job is to regulate the fight or flight response. Thus, the only possible reaction of the fetus or newborn is to activate the Parasympathetic System (dorsal vagal). If fetus or newborn had to activate the Parasympathetic System (dorsal vagal) in order to survive and was not aided in neutralizing the situation afterwards, this system remains active and causes dissociation between body, emotion, and mind—a kind of anesthetic. Such a pervasive reaction was necessary at the time to bear such immense threat and if this activation subsequently persists, the anesthesia continues. This activation can be so powerful that it is difficult for the newborn to regulate himself on his own without proper therapeutic intervention. To cope with this hyperactivation of Parasympathetic System and counterbalance it in order to survive, the person reacts by hyperactivation of Sympathetic System. It is the mechanism of stress: both neurovegetative systems (Parasympathetic and Sympathetic) are in balance because both are activated, rather than being in balance because both are at rest. Therapy ideally restores the balance within the Neurovegetative System (between Parasympathetic and Sympathetic) by allowing the Extrapyramidal System, whose fibers are in the vagus ventral nerve and also in other cranial nerves, to promote the rebalancing between Parasympathetic and Sympathetic Systems, bringing them to rest, and to lead to a feeling of well-being. The physiological effects.Who has suffered a fetal trauma, even that of contact with incompatible blood types, could undergo some physiological changes that may alter the body’s characteristics.These physical characteristics are most noticeable in times of heavy stress. The breath may be short and predominantly in the upper part of the thorax (Lowen, 1975). The skin, in certain cases, appears delicate and translucent. The muscles frequently contract. The person often feels a painful sensation in the area that corresponds to the solar plexus and a cervical block or bracing. It is as if the functions that control sensations are obstructed by this cervical block during their journey from the body up to the head, resulting in a lack of feeling. The bracing may involve not only the base of the cranium, but also the ocular system, which is generally in a state of tension because the person tends to keep everything under control visually. This control may be directed towards the entire body, meaning that various joints can be affected by the bracing. These individuals are particularly sensitive to heat, because it tends to relax muscle bracing, which could cause them to be more easily susceptible to sensations they fear and that they would prefer to avoid (Heller, L. & LaPierre, A., 2012). The emotional effects. The relationship with the mother is emotionally very ambivalent for a person who suffered from a fetal trauma. There is the need and, at the same time, a fear to connect. There is the desire of growing closer, and at the same time, the need to escape. This ambivalence is manifested towards the mother and is repeated in every relationship with the outside world, especially if the relationship is nourishing and important. These individuals can be so afraid of receiving nourishment that they become aggressive enough to bite, like an animal who feels threatened and who, out of fear, bites anyone who comes close. No one is spared from this ambivalence: friends, family, and even the therapist. The desire to bond and the memory of the trauma are merged. Naturally, ambivalence follows in the wake of such a merger. These individuals long for contact and, at the same time, contact is the thing that most frightens them. This fear propels them to want to escape what is perceived as the source of their traumatic experience. They would like to achieve fulfillment, but they deny themselves their own needs, including the ability to feel or experience emotion. They desire what nourishes them, but at the same time, they are afraid of it. The relationship between mother and daughter can become particularly stressful during adolescence, when the daughter seeks a structure for her own identity, including assertiveness and opposition towards parental figures. This, in conclusion, is a short overview of the immunological, neurovegetative, physiological and emotional effects of trauma caused by contact between incompatible mother/daughter blood types. According to my theory (which not only allows early diagnosis, but also preventive diagnosis) this trauma is the ground on which the causes of anorexia in the female teenager are rooted. Therapeutic intervention, in medicine and psychotherapy, is traditionally directed at these causes. International Clinical Practice Guidelines agree that the prognosis of Anorexia depends on: early diagnosis, continuity of treatment, multidisciplinary therapeutic approach. It is clear how we all agree on the importance of early diagnosis. 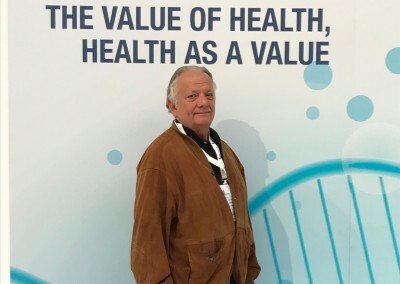 Treatment of food disorders, including Anorexia, must be multidisciplinary, involving more health specialists, who need to deliver coherent messages, having unity in sharing a therapeutic plan. Treatments must be articulated on multiple levels of intensity depending on the patient’s severity level: you go from ambulatory to hospitalization. Let’s see the health professionals who are involved. The central figure is the psychotherapist. The nutritionist is absolutely indispensable for a proper diet re-education of the girl and possibly of the whole family, which often has bad food habits. One or more family therapists are also needed. The patient’s family should be therapeutically followed to help the girl and because the family is often involved in the pathogenesis of her eating disorder. These figures (patient psychotherapist, nutritionist physician, and family therapists) are needed for AN therapy. But the matter can be more complicated. The new forms of adolescent nervous anorexia are often characterized by: lowering the onset of anorexia, association with autolesive behavior, suicidal ideation, and attempted suicide. Self-harm and suicidal behaviors require pharmacotherapy, so in these cases the figure of the psychiatrist is also needed. At this point to further clarify the therapy I think it is good to present a clinical case. Initially I was interviewed by a mother who wanted to be helped to manage her daughter’s anorexia. The mother has blood type 0, daughter A and father A. In the medical history, the mother had had blood loss during the first months of her pregnancy and had had amniocentesis. The delivery was relatively traumatic and the mother suffered an episiotomy to avoid tearing. It is likely that the mother, blood type 0, had come into contact with the blood of her daughter, blood type A. In this case, the mother would have activated, for pure biological reasons, the traumatic alarm of incompatible blood type (see page 11 ). The mother, who was a ballet dancer in adolescence, had a history of severe anorexia and did not feel able to cope with that of her daughter. She wanted her husband to take care of this problem. The idea that her daughter should go to therapy was not yet conceivable in that familiar context. So I accepted her husband as a patient because I thought he needed therapy and also that it was the only way to open a therapy path for her daughter. Being the father’s therapist, following the universally recognized guidelines, I later didn’t take on other roles in anorexic girl therapy. Subsequently, the girl chose a Junghian Analytical Orientation Psychotherapist and EMDR Practitioner. The parents chose a psychologist and psychotherapist for parental support. She later became the mother’s therapist. The role of the nutritionist was hired by a medical doctor, specialist in Food & Nutritional Science. The girl initially showed a lot of resistances to therapy and her slimming continued. In anorexia, treatment resistance is very common. This resistance is intrinsic to anorexia, because the patient has deep ambivalence of wanting to heal and of not wanting to heal. Living without eating is the “basso continuo” that accompanied this patient. The slimming became a weapon to assert herself against the parents, that is, an unconscious psychological defense. There is a disorder of the person’s maturation about attachment and connection processes. These processes have been problematic and perhaps even traumatic in early childhood and fetal life for various causes (to which we add: mother/daughter blood type difference + blood contact between the two). The patient with these attachment dynamics is in need of to be approved, but for her ambivalence this need blends with the need to fight using fasting as a weapon. In treating this patient, as always in the therapy of anorexia, one must keep in mind that the psychic-somatic problem becomes a somatic-psychic problem. Let me explain better: a psychic dynamic creates a somatic situation that, in turn, tends to keep up the psychic dynamic. In fact, fasting, which begins with a psychic dynamics, has a dopaminergic effect on soma. Dopamine makes the person feel full of energy, euphoric and satisfied: it is the hormone of pleasure and reward. At the basis of the gratification given by reduced food intake there is the dopaminergic system of reward which leads to an increase in the push towards food restriction in order to keep the dopamine production high and does not lead to a reduction in hunger, which is the stimulus on the assumption of food, which instead persists. (Zink & Weinberger, 2010). The patient’s weight decreased to 36 kg / 1.60 meters in height (79,3 lb / 5,25 ft) . The clinical case of this patient gives us the opportunity to describe the mechanism of dopamine even in those anorexic girls who, for top-level sports performances (eg ballet dance, artistics gymnastics, cycling), undergo sacrifices and efforts that appear inconceivable to those who are not under the dopaminergic effect caused by inadequate nutritional support. In the athletes there is a so-called “athlete’s triad”, consisting of: nutritional deficiency, amenorrhea, osteoporosis. Our patient, as happens with athletes, also shows an initial osteoporosis to bone densitometry despite adequate electrolytes and vitamins, including Vitamin D, prescribed by the nutritionist. A serious osteoporosis always characterizes severe Anorexia of the Female Adolescentand may be the cause of osteoporosis for the rest of life with an increased risk of fractures. We are not tired of saying throughout this chapter, anorexia is characterized by: weight loss and menstrual cycle loss for more than three months. We repeat this to warn the doctor who, in the face of amenorrhoea resulting from anorexia that probably did not investigate and diagnose, thinks to subject the patient to hormone therapy. The main therapeutic strategy of amenorrhea by anorexia is the improvement of nutritional support with psychological support. This patient has also become amenorrhoeic during anorexia and the menstrual cycle is resumed only after proper weight rebalancing. The therapy of an anorexic patient, which is already not easy to do because of the patient’s resistance, is sometimes even more complicated because of “clinicians’ negative reactions to treatment-resistant or stigmatized patient groups. Some research has found that clinicians across professional disciplines react negatively to patients with eating disorders. Inexperienced clinicians appeared to hold more negative attitudes toward patients with eating disorders than toward other patient groups. Clinician negative reactions in regard to patients with eating disorders typically reflected frustration, hopelessnessentra, lack of competence, and worry” (Thompson-Brenner, Satir, Franko, Herzog, 2012). “Clinicians may play an inadvertent role in perpetuating eating disordered behaviour. Interpersonal reactions are of particular relevance as clinicians (as family members) may react with high expressed emotion and unknowingly encourage eating disorder behaviours to continue. Hostility in the form of coercive refeeding in either a hospital or outpatient setting may strengthen conditioned food avoidance and pessimism may hamper motivation to change” (Treasure, Crane, McKnight, Buchanan, Wolfe,2011). Clinicians must be careful not to get caught in the patient’s play, that is, to have a countertransference of pity, impotence, servility, despair, and even in their opposite of anger, therapeutic fury, refusal to the patient, unfounded hope. A healthy understanding of the patient’s reasons allows the clinician to avoid counter-aggression. The clinician, in the forms of severe anorexia, must handle the distress of death he perceives regarding the patient. Faced with the blackmail of the patient to suicide also by fasting, this anxiety would lead the clinician to a discouragement that leads him to increased anger and control over the patient or lowering his arms. There was this risk with our patient which, despite the therapy, had reached 36 kg at 1.60 meters (79,3 lb / 5,25 ft).But thanks to the expertise and firmness of each of the clinicians and thanks to a clear therapeutic contract, which each clinician had stipulated for achieving attainable goals, discouragement was avoided. It was also necessary to disarm the alarm that the mother projected on her daughter. For this alarm, the mother used to repeat insistently “Did you eat?”, “You have to eat!” This insistence increased her daughter’s blackmail towards her parents by not eating. I did some sessions of therapy to disable mother’s alarm. This therapeutic process began by making the mother aware of how the alarm she had about her daughter probably depended on that alarm she had suffered during pregnancy (contact with incompatible blood type of her daughter). This awareness, that the alarm was due to biological facts she was not responsible for, allowed the mother to calm yourself a little at a time. The mother accepted in good faith that her daughter’s nutrition was entirely taken care of by her husband. He did not have a past of anorexia as she was, in this respect not only was it very serene but was indeed a gourmet. His father started cooking delicious things, in keeping with the nutritionist’s point of view, and attending good restaurants with his daughter. And so, with everyone’s commitment, the patient slowly came to accept a healthier way of controlling nutrition and lifestyle. The weight began to rise. At this point an error, which one could commit, is uncontrolled refeeding that can lead to “refeeding syndrome”. It occurs for sudden and excessive intake of foods after a long period of fasting, especially if they are made up of large amounts of carbohydrates.After a long fast, the sugars eaten quickly go into the bloodstream. Cells absorb these sugars very quickly and require a large amount of electrolytes to metabolize them. These electrolytes are subtracted to the blood, which already has few electrolytes due the long fasting.An electrolyte imbalance is likely, in particular due to phosphorus deficiency, and it can also be deadly for acute heart failure. In fact, refeeding syndrome occurs when no gradual refeeding is planned, with adequate amounts of nutrients, electrolytes, vitamins. But this problem has not occurred with our patient thanks to the good work of the nutritionist.Three years later father and daughter are on a holiday near the sea, it’s summer time. During school time, the daughter spends a lot of time in the kitchen between homework and school hours. So, on this particular holiday, they decide to take a break from the kitchen, as well as from the studies. They run along the Ligurian Riviera looking for gastronomic delicacies, without bias or preference: street food in local food festivals, gourmet restaurants and popular taverns. The idea of a gourmet holiday was absolutely new. Now father and daughter can write: “A few years before, the girl, now an adult, had fallen into a complex trap which is called Anorexia of the Female Adolescent. Her parents, as usually happens, were also confused. It was a situation of shared pain, and nobody had an idea as to what could be done. The dilemma was that the girl knew what she wanted to do: eat as little as possible and eventually reach a state in which she wouldn’t eat anything at all. Escaping that pain was very difficult, a battle with ups and downs. But which battle are we talking about? Who was the enemy? We found the closest description of this battle in the theory about anorexia of Dr. Lorenzo Bracco. For the first time, as a result of this discovery (the alarm due to contact during pregnancy between different mother and daughter blood types, alarm that deeply disrupted their relationship), each family member, including the daughter, found their way of peace beyond conflict with each other. The feeling of being lost, the blame game, and the self-blame into which the family had hopelessly fallen, was slowly replaced by a sense of collaboration against the problem” (Voltolini, Voltolini, 2014). Now this 21-year-old girl is normal weight, has a boyfriend, loves cooking, studying oriental languages at university, and she has been living for six months in Japan, leaving her parents alone with her dog. Bracco, L. (2014) ANOREXIA: The Real Causes: Blood Types and Trauma. Amazon. Heller, L. & LaPierre, A. (2012) Healing Developmental Trauma. (Berkeley, Ca). North Atlantic Books. Lowen, A. (1975) Bioenergetics. New York, Coward, McCarin & Georgen Inc.
Treasure, J. & Crane, A. & McKnight, R. & Buchanan, E. & Wolfe,M. (2011) First do no harm: iatrogenic maintaining factors in anorexia nervosa. Eur Eat Disord Rev. Voltolini, D. & Voltolini, E. (2014) Così abbiamo fatto pace con il cibo(And So, We Became Friends With Food), Corriere della Sera.